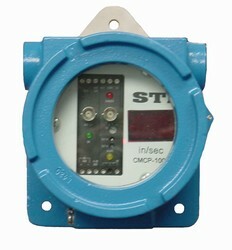 CMCP-1000 Explosion Proof Single Channel Vibration Monitor Reliability Direct, Inc. Your Direct Source for Reliability, Maintenance, Test & Measurement! The CMCP-1000 is a single channel Vibration Monitor with an integral accelerometer packaged in an explosion-proof housing that is suitable for NEC Division I hazardous areas. Designed to comply with rigid API670 standards, the CMCP-1000 far exceeds the capabilities of competitive vibration switches. In addition to the key features listed above, the CMCP-1000 offers a buffered transducer output for detailed diagnostics and optional high-pass and low-pass filters to monitor specific frequency bands.